Now and then, I go through boxes of family letters and photos out of guilt, if nothing else, because I’ve never organized them properly. So much history will disappear if I don’t do something, but the task is daunting. The envelope above, crisscrossed with post office cancellations, forwards, dates, and addresses, caught my eye the other day. 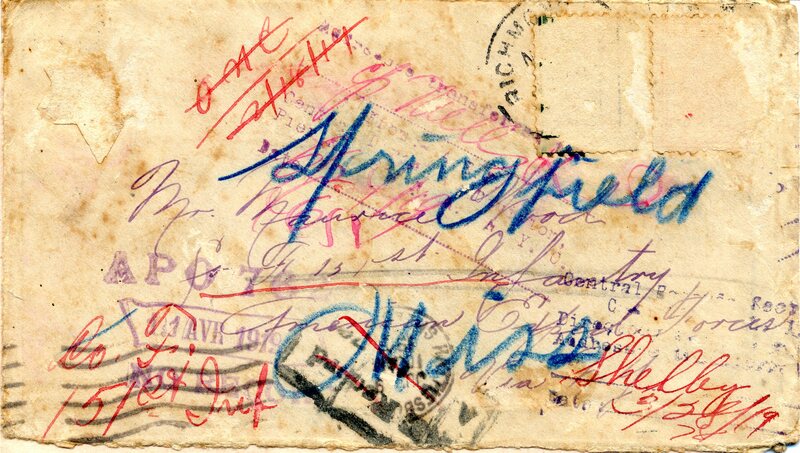 It tells the story of a letter that followed my grandfather to France and back during the last months of World War I and after. It was not written by my grandmother. My grandmother always told me that she and my grandfather met at an ice cream social on a Sunday afternoon. She was “engaged” to another young man at the time, but my grandfather came along that day in his doughboy uniform, and when she saw him across the room, she knew. He shipped out for France soon after. I have only empty envelopes addressed to him in my grandmother’s hand; I don’t know what happened to those letters. I do know that his ship, the Agamemnon, arrived back in New York Harbor on March 11, 1919, and they were married May 24, 1919. A two-month courtship! 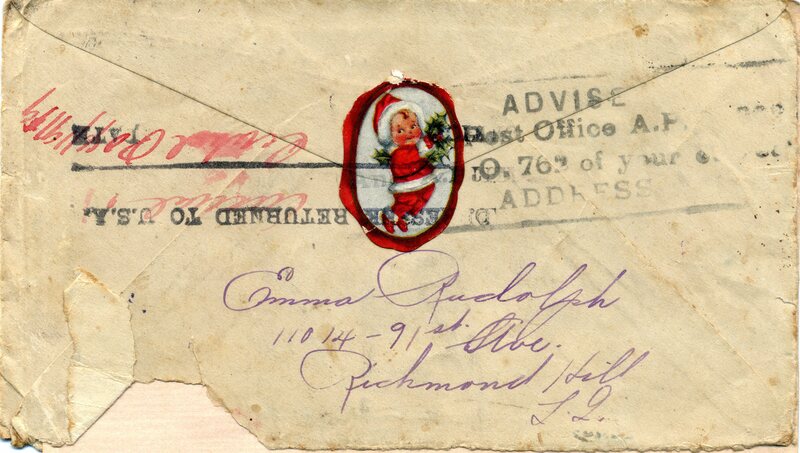 Back to the letter: the writer’s name was Emma Rudolph of Long Island, New York. Apparently, it was customary for New York families to befriend soldiers caught in the limbo of shipping out or returning home. What must that have been like–a twenty-seven year old man from rural Mississippi in the big city for a few days before he went off to war! He was handsome, blue eyes, blond hair, tall. And from the tone of the letter, I believe Emma was smitten. Strange turns of fate, that bring us, and our stories, into being! Letters–never sent or gone astray–play an important role in my WIP, Spirit Lamp, a work of historical fiction set during World War I. Thank you, Emma Rudolph, whoever you were. And thanks to my maternal grandparents, too. If you hadn’t gotten together . . .
Have family artifacts or stories informed your writing? If so, how? Tell me about it! So many fascinating, delicious what-ifs, Gerry! Tingles the imagination! Thanks for linking up with the TALU!!! Nice piece of history Gerry. It’s great that you have these as well as the stories that your grandmother told. I enjoyed reading this post. I felt so sad reading the what if’s. But that’s the way life is. Loved the accompanying story. Their lives were sad, actually, but it’s nice to draw on them for fiction. I don’t think they would mind. How fascinating! Really sets the imagination in motion. Amazing that the letter ever got delivered and then kept all these years. It may represent the real-life story that was never told but that doesn’t mean it can’t launch a thousand fictional ships. The envelope is REALLY small, so yes, that makes it even more amazing that it survived its travels. How I wish I had known about the letter when I was growing up so I could have asked him about it. He died when I was ten. Wow Gerry that’s some keepsake. 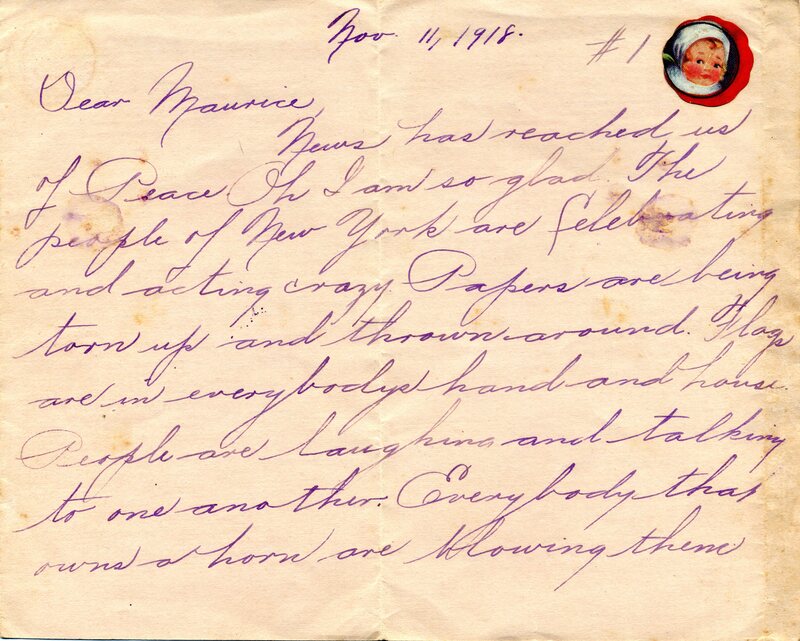 I love old correspondence and often make whole art/story projects around a few letters. These are treasures aren’t they? They are treasures. And sometimes mysteries! My family members were *not* good about writing on the backs of photos and identifying, so in some cases, I don’t know who the people are. These images are so amazing. It’s like a little mini-history, just looking at the stamps and writing. I’m sure letters will provide a great backdrop for you novel. It is a mini-history. Funny that I’d never paid much attention to the actual letter, or maybe I had, but I’d forgotten. My grandmother’s stories tended to vary as she got older. But I love this. Wish I could really preserve it.